Heaven's M.A.G.I.C. members keep the community, city, state, nation and world informed through our Founder/President's Heaven's M.A.G.I.C. Trumpet. I apologize for my absence. I developed a shoulder injury which made it difficult to maintain my duties. I was very fortunate because it was miraculously cured at at Healing Mass at St. Elizabeth Ann Seaton. God took away all of the pain in my frozen shoulder and I was able to breeze through physical therapy. This also enabled me to complete our application for the Varkey GEMS Global Teach Prize. http://www.globalteacherprize.org/ Winning that prize would be such a BOOST for Service-Learning in the world. Rio Vista has done an excellent job with their Trick-or Treat collection for U.N.I.C.E.F. this year. Ms. Molera's class brough in the most money and they have earned the Eegee's party. Go Bulldogs!! I was also blessed to be able to attend a No Excuses Univeristy http://noexcusesu.com/ National Convention this year in Las Vegas. I really value the No Excuses team vision and mission and I met some amazing people at the convention. I love that someone said,"No, No Excuses. They are just as capable of getting into college as anyone else!" While I was at the NEU http://noexcusesu.com/ Convention, I discovered a very special organization that supports children with Pediatric Brain Cancer. "Friends of Jaclyn" http://www.friendsofjaclyn.org/ is an amazing non profit organization that partners college athletic teams with children who are dealing with the challenges of brain cancer. We trust that in the future Heaven's Miraculous Angelic Giving Inspirational Child will be able to have Service-Learning chapters to support excellent organizations like "Friends of Jaclyn"
Amphitheather School DIstrict has purchased several Google Chromebooks. Thank you Google:)Rio VIsta has gone higher tech! We will now have Google Chromebooks in the classroom. My students and I are very excited about adding this exciting new technology piece to our classrooms. We will able to practice our math facts http://freerice.com/#/basic-math-pre-algebra/16878 and our vocabulary http://freerice.com/#/english-vocabulary/1449 while helping children arounfd the world. They will also be able to use them for research and publishing the school newspaper, The Bulldog Gazette. The Bulldog Gazette team works on articles that cover Science, Technology, Engineering, Math and Service-Learning articles on a quarterly basis. I have been on an absence, but will I resume the Newspapaer Technology group in the new year. 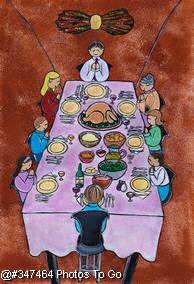 As we reflect on the upcoming holiday, we are grateful for all of our blessings and pray for those less fortunate in the world. We trust that in the future we will be able to teach many people in need how to care for themselves and others through Service-Learning activities. We especially like http://www.heifer.org/gift-catalog/index.html?msource=KIK1B130002&gclid=CjwKEAiAhcGjBRDot_fjjtPKrgsSJACNYh76pVClWKOJ7R5WB-cGrIinIlfJ26_t3ZZDzY02if_4qRoCa2Dw_wcB the Heifer International vision for helping those families around the world. As I reflect on the past and how my 5th grade students raised money to purchase a goat for a family, I am excited to envision many teachers and their students choosing "Heifer International" as a Service-Learning activity. With reagards to business, we were able to retain our Google Adwords grant. Thank you Google and all of the Google people!! As a teacher I do the best I can with keeping Heaven's Miraculous Angelic Giving Inspirational Child, Inc. relevant and alive. Most of the time I am Tweeting Service Learning activities. If you are looking for great ideas on Service-Learning, join us on Twitter, there are a plethora of examples of Service-Learning there. https://twitter.com/heavensmagiclao. Becuase we have not received any donations, we lost our 501C3 status, but we were able to become a Foundation and any legal questions fro our organization can be answered by John T Shelby at http://www.taylorhillmanshelbyltd.com/attorneyprofiles.aspx. We have received support in our incorporation by Roger Taylor, Adword Grants, supplies and prayers and we are very grateful for those:) I am positive that with a significant benefactor/s, we would easily regain our 501c3 status. We trust that those benefactors are out there and will find us in the future. Please remember that I am a teacher and I have all of the responsibilites that come with that career. Service-Learning is part of my focus in the classroom, but there are so many other responsibilities that require my time to be directed elsewhere. I would never to anything dishonest or deceive the public about our organization. In reflecting on the Varkey GEMS Global Teach Prize, http://www.globalteacherprize.org/ we are excited to imagine that everything we have dreamed about could launch in an instant! Service-Learning would become part of the curriculum throughout the world and the world will become more heavenly. Currently, they are selecting fifty finalists, from those fifty they will choose ten, and from that ten they will change the life of one teacher in the world. I think what I LOVE most about about the Varkey GEMS Global Teach Prize http://www.globalteacherprize.org/ is that Sonny Varkey and his team cared enough to create it. It acknowlwdges that teachers have great ideas and that with the grace of God, they are just as capable as engineers, scientists, and business people of having an amazing idea that could miraculously change the world and make it more heavenly. For the most recent news, please scroll down to the bottom. Recently, our Founder/President was given the opportunity to apply for a $500,000 matching grant opportunity from Theresa's Fund. 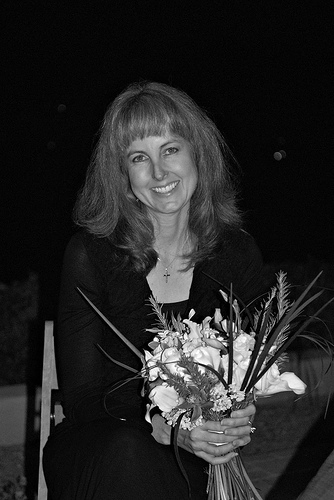 Laura Ann Osterman designed a project for the grant entitled Theresa's Fund Loves Heaven's M.A.G.I.C. and is in the process of building a larger Board for the organization and rallying the Tucson community to support the project. The project solicits funding to provide a $5,000.00 scholarship for teachers and college students willing to lead Heaven's M.A.G.I.C chapters in their community. Teacher's in schools participate in Service-Learning curriculum in Knowledge-Creating Schools and provide occasional after school activities for their members. College students participate by organizing and fundraising to support Heaven's M.A.G.I.C. chapters in their community. I have delivered Heaven's M.A.G.I.C. 's Project/Proposal for Theresa's Fund. I am optimistic about the future for Heaven's M.A.G.I.C. I pray that we will have support from the community, state, schools, non profit organizations that support education, univiersities, businesses and endowments that we need to start creating Theresa's Fund Loves Heaven's M.A.G.I.C. chapters in the near future. We will know where we stand in the grant seletion process sometime at the end of July. I will keep in touch, informing you of our progress throughout the entire process. I sincerely appreciate everyone who has taken the time to view our website and pass it on to others. Congratulations to the Class of 2007! The founding members of Heaven's Miraculous Angelic Giving Inspirational Child. May they continue to Love, Serve & Learn as they pursue their careers, goals and dreams in the future. I am excited to report that The Tucson Unified School District has chosen me to teach the U.T.O.P.I.A. Project and explain the Theresa's Fund Loves Heaven's M.A.G.I.C Project to teachers at the "Back to School Conference" in August. At this conference I will be able to locate teachers who are interested in becoming leaders of the Theresa's Fund Loves Heaven's M.A.G.I.C. Chapters and the teachers can help us get the message of our projects out to the community. Thinking optimistically, it will also provide me with an opportunity to practice and refine my presentation, before I present the projects to the Star Committee. August 2007 News Coming Soon! Thank You for sharing our message with others. Dear Friends of Heaven’s M.A.G.I.C. throughout the World! Heaven’s M.A.G.I.C. has received many blessings in the past six months. We have a system to channel resources to time and energy which can be duplicated and reach out to others on a global scale, the support of Google, a website that is viewed throughout the world, a larger dedicated, optimistic, and enthusiastic board, and the U.T.O.P.I.A. Project’s presentation at the Back to school conference introduced us to many teachers who will be willing to become a part of this project in 2008. However, the blessing of Theresa’s Fund and the $500,000 matching grant will be bestowed on another non profit organization that serves to eliminate abuse and domestic violence in the state of Arizona in 2007. We received a gracious rejection letter from the Chairwoman of Theresa’s Fund. Her letter encouraged us to reapply in the future and had a “God’s delays are not God’s denials”, tone. I believe our “seed” will be able grow and strengthen in order to meet more of the criteria for Theresa’s Fund in the future. We have the utmost respect for Mr. McMurry, all of the employees at McMurry, and the volunteers who choose the beneficiary for Theresa’s Fund. We have been working diligently to contact Business Angels, Angels Investors, Venture Capitalists and many other organizations and individuals. We have faith that they will be generous to our organization and help it prosper. We have asked the Board of Theresa’s Fund to continue to refer to the project as the Theresa’s Fund Loves Heaven’s M.A.G.I.C. Project. The system to channel resources to time and energy that can be duplicated and reach out to others on a global scale was designed by the grace of God after Mr. McMurry’s prayer and the package Mr. McMurry sent us lead to all of Heaven’s M.A.G.I.C.’s blessings mentioned above. We trust that we will be able to raise $1,000,000 and that the first attendees of the U.T.O.P.I.A. Project’s presentation will be leading their chapters in 2008. We will continue to do whatever it takes to accomplish those objectives. We are blessed to have the technology to be able to reach 1,000,000 people and if those 1,000,000 people are able to send us one dollar, we can easily reach our goal. We appreciate anyone who supports the mission and vision of Heaven’s M.A.G.I.C., especially those of you who have added us to your favorites. You all have a special place in our hearts. You are the wind beneath Heaven’s Miraculous Angelic Giving Inspirational Child’s wings! 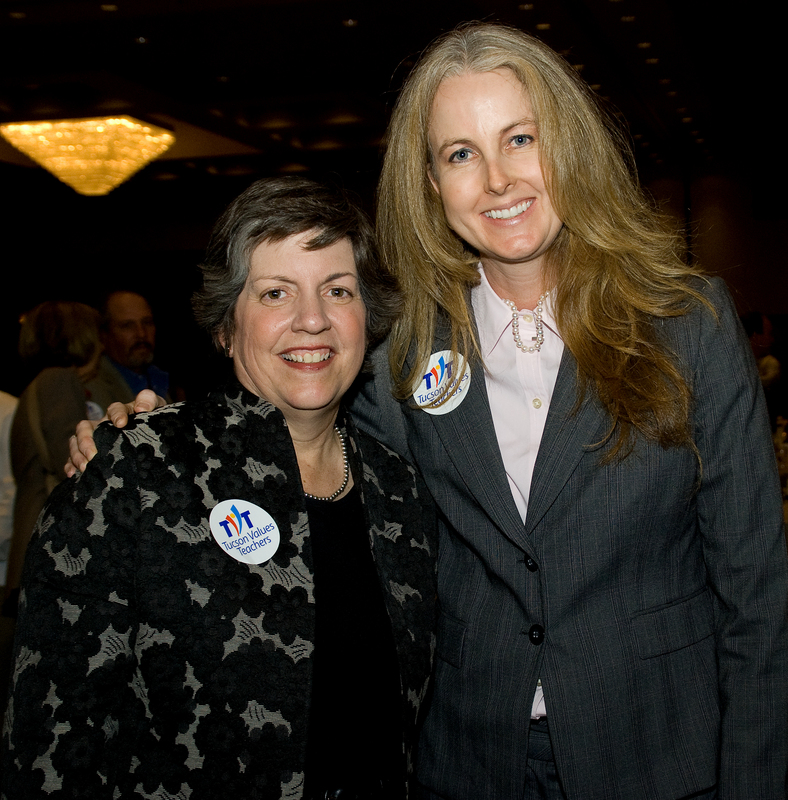 God Bless Janet Napolitano for this gift to Arizona! She signed this Executive Order on the day I found out that we would not receive Theresa’s Fund. I did not find out about it until after I had to compose this difficult newsletter to notify our supporters that we would not receive the $500,000 matching grant. Today is a miraculous day! We have officially received a Google Grant ! We are thirllled and excited to be a beneficiary of Google's desire to support non profit organizations. We continue to contact potential supporters and focus on raising the money to create ten chapters for the 2008-2009 school year. We trust that the future will be filled with many blessings yet to come. May you feel, loved, healthy, safe and happy! Founder and President Heaven's M.A.G.I.C. from the month of October! First, I met with my business counselors at SCORE. to help me design our 2008 Business Plan! able to reach people all over the globe! my best to complete it as soon as possible. recommend you read her book. their children towards service in their community. have made and can make so much of a difference! to channel their energy and time. strong group with huge hearts for helping others. relationship with my new friends up north. experiences to help our precious seed blossom. a blessed Thanksgiving, Diwali, and peaceful holiday of your choice ! I am thankful for everything! Many exciting things have occured since I last wrote to you. opportunity to have a free non profit account! We have received a generous donation from one of our supporters! started on our "Bullet Proof" Business Plan. to accomplish our 2008 Goals! We love Google and the Case Foundation! M.A.G.I.C. and to provide my students with phenomenal resources. to learn about this, bing, done! world and we look towards a better future for us ALL! May you and yours have a blessed holiday season! For those who love Jesus, Merry Christmas and Happy New Year for all! guide you through any challenges you may incur in 2008. Recently, I wrote another poem, Please consider it my gift to you. I am thrilled about the following objectives at the World Economic Forum 2008. I sincerely appreciate the opportunity to listen in on the conference. I have captured how our organization is in sync with the World Economic Forum's Goals for 2008 below. We would love to help anyone and/or any corporation meet their obligations for corporate stewardship. An excellent closing speech below! However, there were a few slips of the tongue. I have attended my SCORE Business Planning class and I am in the process of writing our Miraculous Business Plan. I sincerely appreciate all of you who have viewed our website, shared it with others, and have added us to your favorites. I enjoyed reading Brent Bower's 8 Patterns of Highly Effective Entrepreneurs http://kslye.blogspot.com/2007/11/8-paterns-of-highly-effective.html over the holiday break. I am extremely optimistic about the future. I am a Davos woman! The vision of Heaven's M.A.G.I.C. will be realized!! I wish you all peace, health and prosperity for 2008. In 1999 Heaven's M.A.G.I.C. organized and lead Immacualate Heart Academy to win the 94.9 Mixx FM Diaper Drive. Valid and reliable research on Service- Learning indicates that the Theresa's Fund Loves Heaven's M.A.G.I.C Project is proactive way to solve problems in a community . · Children do not need to find transportation to get to their chapter because it is in their school. · It has low costs because it utilizes the existing infrastructure, manpower, and system within the schools. · It provides an outlet for creativity, leadership, innovation and reflection. · It is a place to belong and make new friends. · It teaches children to work together, plan, set goals and achieve them. · It encourages communities to coalesce and work together to solve their challenges and problems. · It makes members lives more meaningful and inspires them to make a difference. · It teaches children that they have something to give to others. · Service-Learning is a tool to enhance standards and align curriculum. · Educators have a strong desire to implement Service-Learning into their classrooms. · It increases self esteem, and self worth. · It creates more trustworthy, trusting, reliable and tolerant students. · It creates interests in politics and political events. · It shows more responsibility towards voting and moral character. · It creates more responsibility towards doing homework, more active participation in class, and improvement in problem solving skills. · With regards towards future career aspirations, Service-Learners were better prepared for their future careers. They had more communication skills and became more aware of the opportunities and possibilities toward a variety of future careers. drug and alcohol abuse, and criminal activity. The community begins to view children in a more positive light. It creates leadership opportunities for children, college students, and adults. It brings a community together insolidarity to create a Powerful Force For Good. Our organization welcomes Pat Gordon, Emily Calica Krevcheski, Matthew Stipulkoski, and Vik Saksena to the Board. This newsletter and a separate page are dedicated to Heaven’s M.A.G.I.C. My Miniature Schnauzer, Mandorla Angelique Tresor, "Mandy." to take care of the household. even when she was just there laying beside me. not noticing the symptoms until it was too late. and was taken into God's loving arms on Ash Wednesday. would never go beyond my sight or just take off and run away. I remember the first time that I saw her, she took to me right way. that was indescribable. She had such a spark! was never sick a day in her life, at least in my eyes. and wait to play, as I created the U.T.O.P.I.A. Project. Heaven's M.A.G.I.C. into a thriving organization. future to be with her. I was wrong. not trade those moments for the ache in my heart right now. weeks, so I figured she was already taken by someone else. I said, " Hi little one, we're back, and we've come to take you home." My fondest memory of her was when she was a puppy. to pieces throughout my bedroom. which appeared to look like snow. She had a "yeah can I help you, I am a little busy right now"
look on her beautiful face. My mother and I laughed so hard. I still hope to find the photo that we took that day. She managed to make it snow in the desert, and that was quite a feat. towards Service-Learning projects that support diabetes. of a special unique soul, Mandorla Angelique Tresor, "Mandy"
Heaven's Miraculous Angelic Giving Inspirational Canine. will one day bear her name. I loved Mandy from the first moment I saw her. I will always love her and hold her in my heart forever. Theresa's Fund Loves Heaven's M.A.G.I.C. Service-Learning chapters throughout the world! You were always loyal, loving, and kind. I wish you and I could have had more time. I remember when you first caught my eye. Now that you’re gone, tears well up, I cry. We had to settle for only one decade. In that time, a strong and loyal bond we made. I will always cherish my memories of you. Your love was beautiful, wonderful, and true. You’re in a place where you will never feel pain. Your soul and spirit will renew once again. You were a spirit unique and free. Happy go lucky, and full of glee. You radiated love and grace. will always outweigh my pain in the end. Until the day we will meet once again. Godspeed haloed angelic treasured friend. who has lost a loved one to diabetes. God's creatures and children in the future. March news is looking excellent! There will be a National Forum on Service-Learning! We are extremely excited about this!! TIME Magazine, and William and Mary University! I would love to meet these people someday. David Smith, executive director of the National Conference on Citizenship. We hope to be a part of the forums in the future! This must be so exciting to Dr. Shelley Billig, ! WOW! and is considered the dean of the service learning research community. She knows about Heaven's M.A.G.I.C.! I am still working on the 2008 Business Plan. A very nice librarian, Deborah Brown, is helping me with all of the research! We have created a slogan for our organization! The "Fountain of Youth" for your spirit, love, and service. I will be back with more of our progress at the end of the month.. This month we were blessed to be referred to Mr. Robert Fick, an Advanced Business Analyst in the Small Business Development Center at Pima Community College. Bob is brilliant! He is helping us edit and trim our Business Plan and refine it so that we will be able to present it to the community. He also has a tremendous amount of experience and advice to assist us in accomplishing Heaven's M.A.G.I.C. 's mission and vision in the future. We are learning many important things about business and running a business properly. We would also like to take this time to thank the Desert Angels for their advice and support. Our mission and vision will require a tremendous amount of support and we are very grateful to everyone who supports Heaven's M.A.G.I.C. From Google, to the Heaven's M.A.G.I.C. Board, to our potential Angel Investors, to Bob, to those of you who share our website with others and spread our message throughout the world, we appreciate your support! Please understand that we are putting 100% into making sure this Business Plan is a miraculous plan and creates posiitve changes for the entire world! Please remember to keep us in your thoughts and prayers. I am blessed to be surrounded by so many people who care about helping us accomplish our mission and vision. On a more personal note, regardless of anyone's faith, I was very touched by the Pope's message to the world. He spoke many times on liberty, forgiveness, hope, and peace. He asked us to embrace our similarities rather than focusing on our differences to create a better world and he walked his talk the entire time he was here. Dear Friends of Heaven's M.A.G.I.C. As the August deadline for our 2008 goal to raise $1,000,000.00 approaches, I am reminded by my mother's wisdom. She would always say..."God's delays are not God's denials." I will not accept defeat until August 8th at 11:59 A.M.
On August 9th I will reevaluate our goals and set another one accordingly. tremendous amount about the Business World. Now that school is out and I am only working one job, I have more time to dedicate to Heaven's M.A.G.I.C. May was an extremely challenging month for me personally. I have been teaching for over 10 years and I have never lost a student. At the end of the school year one of my students became seriously ill.
Leilani Rowley has aplastic anemia. She has been in and out of the University Medical Center in Medical Center in Tucson, Arizona several times, had many surgeries, transfusions for blood and platelets, etc. I would like to take this time to ask anyone in the world, especially those of you in the United States and those of you who have O+ blood, if you do donate blood, and you do not give specifically to one individual, please donate in Leilani Rowley's name. I truly admire this Leilani's courage deal with the pain, numerous procedures and frustration that accompanies this illness. Please help us help my student, Leilani Rowley, in the fight of her life! She may need a bone marrow transplant in the future. Life dealt this child a serious blow and all of us continue to pray for Leilani Rowley, Heaven's Miraculous Angelic Giving Inspirational Child. I would like to thank Tu Nidito http://www.tunidito.org/for providing a safe place for Leilani and her family to stay while she continues to receive transfusions and treatment at the University Medical Center. Please hug your loved ones, especially the little loved ones. It is heartbreaking to see them go from invincible bundles of energy to fragile and weak in an instant. Please cherish the times that they wear you out because they are thriving and not fighting to survive. I pray for a miracle for Leilani everyday. Dear Friends of Heaven's Miraculous Angelic Giving Inspirational Child, Inc. It is with deep sorrow that we honor Erik Hite, a fallen hero within our community. It is difficult for us to make sense of tragedy like this. We grieve for those who suffer the loss of their loved ones because of senseless acts of violence. We would love to be able to create a Heaven's M.A.G.I.C. Chapter to honor Officers Hite, Hardesty and many other fallen law enforcement officers. The only thing that brings us peace in times like these is that an Erik Hite Chapter of Heaven's Miraculous Angelic Giving Inspirational Child will be able to create a more peaceful community and make a difference in the future. Please keep Officer Erik Hite's family in your prayers. God Bless Erik Hite and the Hite family. This is usually that time of year when I think, "Wow! The summer flew by so quickly!" This was an extremely productive summer! We are almost finished with our Business Plan and we have begun our journey to acquire a plethora of advisers who will help us accomplish Heaven's M.A.G.I.C. 's mission and vision in the future. If you yourselves have any advice or skills you would like to contribute to assist us, please contact us at heavensmagiclao@hotmail.com. We have less than two weeks to make our goal of raising $1,000,000.00. In the current struggling economy that was quite an ambitious goal, but I am quite an ambitious woman! I was blessed to have met a very special woman this month. Suzanne Shadonix, the Principal of St. Elizabeth Ann Seaton School, http://www.school.seastucson.org/index.php told me that she believes "God answers our prayers in one of three ways: Yes, Not Yet, or I have something better in mind." So many of our prayers for Heaven's M.A.G.I.C. have been answered with "Yes! ", up until this point. We are still in the "Not Yet" phase of the Business Plan, but we trust that God does have "Something better in mind" for Heaven's M.A.G.I.C. in the future. Who knows what the future may hold for all of us, there will be times in the future when we will pray for comfort, assistance and guidance, and what better way to deal with the results than rejoicing in "Yes", accepting "Not Yet" or trusting that God has "Something better in mind." For this month, in addition to all of those of you throughout the world who believe in us, support us, and share Heaven's M.A.G.I.C. with others, Suzanne Shadonix's inspirational faith, hope, love and wisdom has joined all of us, as the wind beneath our wings. As always, we are grateful to Google for guiding us towards a global understanding, helping us locate our resources to excel, and spreading our mission, vision, and messages throughout the world! Heaven's M.A.G.I.C. trusts that God has "Something better in mind" and that one day our ChipIn Widget will runneth over with infinite donations from around the world and we are grateful that He put Suzanne Sahdonix's faith, hope, love, and wisdom in our path at the perfect moment in time. We pray, hope, and trust, and we are focusing all of our time, effort and energy, towards announcing that the Business Plan will be completed in our August News! August was an extremely busy month for me personally and professionally. There were several birthdays! It was also the beginning of the school year and I was engaged in a lot of reading of recent research on Service-Learning. You can download their latest “Growing to Greatness” 2008 Report from here on the National Youth Leadership Council’s website. We also continue to work on our Business Plan for 2008-2009 with Mr. Bob Fick at the Small Business Development Center on the Pima Community College Campus. Writing a Business Plan is kind of like giving birth. In our case it might be the birth of an elephant and not a child! We might need the extra three months J I realize that there might be individuals out there who might be getting impatient at this point. However, please understand that we think it is more important to do this right rather than quickly. There are many guidelines, laws, rules and procedures in business that must be considered. Nothing worthwhile is every easy and this Business Plan must be the most worthwhile mission and vision on the earth. It has the potential to create peace, prosperity, abundance and wisdom throughout the world! In our endeavor to expand our organization throughout the state, nation, and world in the future, we are involved in Service-Learning on a massive scale! Peace and prosperity to you and yours! In September I attended “Where We Stand”. It was “A Conversation about Arizona’s Schools in Tucson.” There were four of the conferences going on at the same time throughout the four regions; Flagstaff, West and Central Phoenix and Tucson. I am extremely hopeful that the political, business, and educational leaders in Arizona are starting to become more innovative, creative, and active in incorporating Service-Learning, portfolio based assessment and guidelines for implementing more Peer Reviewed materials into the education process. We have worked very hard this year to outline exactly how we will encourage private, charter and public schools to implement Service-Learning into their districts, schools and classrooms. I have also begun to realize how important it will be for me to have the ability to give 100% of my time to my role as the Founder and President of Heaven’s M.A.G.I.C., Inc. in the future. On a sad note, I was disappointed that Google decided to move out of Arizona. I hope that they will come back in the future. I believe that implementing Service-Learning throughout Arizona will create a thriving, creative, innovative, and scientifically advanced population and that there will be many opportunities for Google to develop products here in the future. It’s possible that Google just might have to create charter schools and grow their own. They are just so far ahead of any public institution capabilities. There are very few schools who can deliver what they expect at this point. If everyone worked in a Google environment, the world would be more productive. If every teacher taught in a Google environment, they would never quit and would mostly likely delay retirement until their last breath. If every child learned in a Google environment, they would blow your mind!! I am seriously surprised that other companies, schools, and universities, have not tried to duplicate the Google environment! We will do our best to duplicate the Google environment in our organization and in our Heaven’s M.A.G.I.C., Inc. Chapters. We want our members to feel comfortable, flexible, and free to create, innovate, explore, and discover the limitless potential for Service-Learning in their future! This has already been an unforgettable month for me! It started off with a bang on October 1st! education and are working very hard to improve it in this region. This is a perfect example of the Theresa's Fund Loves Heaven's M.A.G.I.C. take care of the children K-12. Heaven's Miraculous Angelic Giving Inspirational Child at heart! in a HUGE way and I am extremely grateful for their efforts! Google... Would you consider coming to Tucson in the future? to have an internship with you for the summer ! Thank you for keeping us in your thoughts and prayers! This has been an unforgettable month for the United States of America! Seeing tears in Oprah Winfrey's and Jessie Jackson's eyes made me realize how naive and blessed I have been to be sheltered from the the injustices many people have seen, felt and heard. I HOPE that many people realize that many of us were never a part of that injustice and treat us the way they would want to be treated, instead of the unkind ways they have been treated by others. We, the members of Heaven's M.A.G.I.C. have worked so hard to make significant differences for ALL! Our organization will never endorse one particular person for President. However, we will always respect our privilege as a nation to vote, the will of the people, the office, and the leader in the position. Our efforts to create Heaven's M.A.G.I.C. Service-Learning chapters throughout the world requires tolerance, acceptance, forgiveness, patience, courage, understanding and love for ALL! Government is one of our four resources we need for our project in order to accomplish our mission and vision. We would like to create our chapters in public schools, charter and private schools and we need teachers throughout the world to support our effort to instill Service-Learning in the world. Personally, tears come to my eyes when I consider what Heaven's M.A.G.I.C will be able to do in 40 years! Barack Obama has been blessed to become the first African American President of the United States of America! We would love to build Heaven's M.A.G.I.C. Chapters to honor, Ann Soetoro and Madelyn Dunham, and the women who helped him achieve his dreams. I have a dream too:) It's is going to take a lot of work, and I have much to learn but I believe I am up to the task. Believe, hope and trust in the ability to achieve your dreams! We did.. and it is a joy to live it! The dreams we have for ourselves are miniscule compared to the dreams He has for us! The U.T.O.P.I.A. Project begins with the words "Understanding towards the needs of others." We believe and trust that understanding and compassion will help us create a more peaceful, plentiful, and loving world! Peace, hope, and love to all of our friends throughout the world! The people of India and those throughout the world are in our thoughts and prayers. May God help heal your pain in this time of loss and give you the strength to endure this tragedy. Our desire is to create a Powerful Force For Good, a tolerant human race that focuses on our commonalities and not our differences, so that these tragedies will not occur in the future. We hope that people around the world will consider creating Heaven's M.A.G.I.C. Chapters in their schools, in their countries and dedicating them to the innocent tourists and citizens of India who were brutally murdered by the terrorists, and the courageous Indian police and military officers who sacrificed their lives to fight terrorism and save the lives of others. They will be remembered, they should not be forgotten. We pray for PEACE on EARTH. We ALL believe in ANGELS! Pray that the ANGELS will guide us on a path towards peace. This type of tragedy affects us deeply and makes us more determined to accomplish Heaven's M.A.G.I.C. 's mission and vision. We understand that things are tough everywhere. Many countries, states, cities, and towns have felt the impact of the economic downturn. Arizona has recently decided to make cuts to the Education budget for all state universities and K-12 education, in order to save the state from going bankrupt. We just HOPE that this is our organization's opportunity to step up and work with local school districts. We TRUST that in the future all children and teachers who are willing to engage in Service-Learning will have the opportunity to work with us, help us help others endure these trying times, and LOVE, SERVE, and LEARN. We were thrilled last month to learn of an Arizona State Statute that allows school distircts to rent space to profit and non profit organizations. The 2009 Business Plan will need to be revised and adjusted to meet new expenses and costs. Rest assured that we will always focus on QUALITY over quantity and that we will NEVER borrow or go into debt to run our organization. We believe that Service-Learning is the best solution for Arizona in these trying times, especially with deficits in the education budget. When things are great, be grateful for how great things are. When things are challenging, be grateful for how great things are. Don't be ENSLAVED by FEAR! FAITH and TRUST will LIBERATE you from FEAR! Our thoughts and prayers go out to everyone and every living creature in Australia who has suffered from the tragedy of the wildfires. The brave people who risk their lives to protect us, all of God's creatures and our property, especially our homes. Despite all of the tragedy in the world, we are optimistically looking forward to Valentine's Day and the celebration of our eighth year of incorporation! Our thoughts and prayers go out to ALL of the family and friends of those who were on flight 3407. This is a wonderful tribute to them. May you find peace and comfort in His love. March and April news coming soon! I apologize wholeheartedly about the fact that this news letter has been delayed. As soon as I am able, I will share great news about my students efforts this year to support the Heifer Foundation! Arizona , and locally in this area. In addition, there were also cuts made to Pima Community College and the Small Business Development Center. We are very concerned that we may lose the greatly apppreciated, free assistance from Mr. Bob Fick . please contact Mr. Bob Fick at 1(520) 206 6404. People like myself, who envision a better future and have innovative ideas, need the services Mr. Bob Fick provides. How difficult do you think it would be for an educator to understand the Business World? I can honestly tell you that Business is it's own culture. It has specific rules, norms, language, laws, dress, and etiquette. our mission and vision for the community, state, country, and world! When we went searching for a service to help us write a Business Plan, they were asking for over $4,000.00. people out there who have great ideas, but they might be able to afford the guidance they need. we would like to continue to work with him. He believes in what we want to accomplish. to grow and expand in the future! Heaven's M.A.G.I.C., Inc. Loves Mr. Bob Fick, Advanced Business Analyst at the Pima Community College Small Business Development Center! Please, please, please find a way to keep the Pima Community College Small Business Development Center ALIVE! Heaven's M.A.G.I.C., Inc. was created by a teacher and her students in a classroom! As a "Classroots" organization we need the support of the community, we need people like Mr. Bob Fick! Those who fight for liberty throught the world are in our thoughts and prayers! This newsletter is dedicated to the people of Oakland. This message is especially for the youth. In addition, if there are any other communities out there that wish to participate, please feel free to join in. Please share our website with others to inspire and bring faith, hope, love and healing to your community. You, your friends and family are in our prayers and the prayers of others around the world. John Alfred Pierre Dennis Jr. Anytime Heaven's Miraculous Angelic Giving Inspirational Child suffers we suffer!! We are asking for everyone around the world to help reduce the homicides in Oakland and be part of a miracle! Youth of Oakland...Focus on what you want, pray, read "The U.T.O.P.I.A. Project", take it into your schools, engage in Service-Learning, and have faith. Always "remember" and never forget that you are Heaven's Miraculous Angelic Giving Inspirational Child! worthy of love and support, worthy of happiness and fulfillment. without need of explanation within my mind, soul, body and life! This message is for Christian Rossiter in Australia. Please don't give up! You have no idea what the future holds. every day. What matters most is the mind, heart, and soul. You have a purpose in this world! We are outraged at the senseless killing of innocent people, most recently that of Annie Le. watch its aftermath on the news. NOW is the time to step up and say NO MORE! NOW is the time to take back the night! our local, state and national government from people who allow this to happen. cancer and now we may never know. of you, throughout the world who have lost your loved ones to senseless acts of violence and evil. prevented as much as possible with Service-Learning in the future. Coalesce, oragnize and eliminate the darkness with your LIGHT! the ruin of souls. Amen. the light and heal the world. Rest in peace my beloved sister in faith. Enjoy your eternal life and rest in the splendor of your rewards in heaven. Our biggest challenge in expanding our organization has been raising "seed" money, but we feel very blessed to have been given an alternative sloution in these difficult economic times. My 2009 gift to our supporters "The Kingdom of God; Rejoice, Awaken and Arise" on my Youtube channel CRE8HVNONEARTH is circulating throughout the world and has been gaining a lot of support. We hope, pray and trust that "The Switch" will create a boost to our efforts of helping the less fortunate throughout the world. This and our Google Adwords Grant have given us the faith to continue to pursue our mission and our vision. Recently, I have been working on networking and learning as much as I can about business. I took an opportunity to attend a networking event at the Tucson Chamber of Commerce and everyone was so helpful, friendly, and supportive. During the event I even won a door prize from Office Depot. It was a bag filled with many earth friendly, colorful, recycled office products. I was thrilled to see how businesses are stepping up to carry recycled and earth friendlier products! 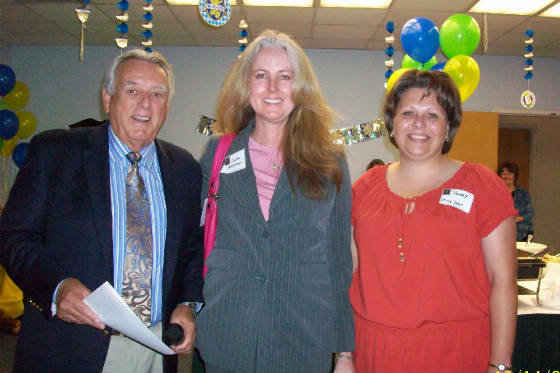 Jack Camper, President of the Tucson Chamber of Commerce, Laura Ann Osterman, Founder and President Heaven's Miraculous Angelic Giving Inspirational Child, Inc., and Tammy Child of Office Depot. In effort to make sure that my mind is able to catch up to my heart and soul, after prayer, reflection, and comtemplation, I have decided to apply for a Doctoral Program in Educational Leadership at Northern Arizona University. I created "The U.T.O.P.I.A. Project" while I was working on my M.Ed. in Leadership at Northern Arizona University and I can't imagine what God will have in store for me in a Doctorate program. I feel that the knowledge and skills set of this program will be very beneficial to our organization in the future. I ask that you keep me in your thoughts and prayers as I work on this endeavor and I am excited about the potential to create, engage in, and defend a dissertation of Educational Leadership, with regards to Service-Learning activities, experiences, and research within my community in the future. If I am fortunate to be accepted into the Ed.D. program in Educational Leadership and I become unable to perform my duties as President I will make sure that a member from our fabulous, energetic, supportive Heaven's M.A.G.I.C., Inc. Board takes over in my absence. I will always be blessed to be the Founder, that will never change. With regards to fabulous news in the school system, a teacher at Safford K-8 Engineering and Technology Magnet School, the middle school for the elementary school I teach in, was awarded "Arizona History Teacher Of the Year"
Kate Gilbert engages her classes in Service-Learning. Her students helped tutor my students last year, and she encouraged the elementary school students to raise money for The Heifer Foundation. She teaches students that school is a blessing, because many children throughout the world do not have the ability to go to school. She uses portfolios in her classroom and she attended a lengthy program working with graduate students and university professors in the field of History. This university experience would be similar to the idea behind Dr. Hargreaves' Knowledge-Creating School concept. She is an example of "The U.T.O.P.I.A. Project" and she is one of many teachers that I would like to be able to offer our bonus grant to in the future. I am thrilled because something I belived in and had faith in is coming into fruition. It is humbling, amazing and breathtaking to see my research come to life in the community. If anyone else out there knows of anyone else who has engaged, engagaes or will engage in these experiences, please share it with us! On a sad note, we have not forgotton Derrion Albert. Our prayers are with Derrion's family and friends. We pray for a better future and believe in a time when people will live in abundance, peace, faith, and love. We pray that people in Chicago have a chance to view "The Kingdom of God; Rejoice, Awaken and Arise" on our Youtube channel CRE8HVNONEARTH and that Chicago does "The Switch" to save its community. We pray that students in Chicago begin to engage in "The U.T.O.P.I.A. Project", LOVE, SERVE, and LEARN and transform their community in the future. God grant us the sereneity to accept the things we cannnot change, courage to change the things we can and the wisdom to know the difference. Don't be afraid to change your community, city, state and the world! Have the COURAGE to transform the darkness into the light Chicago. Show your brothers and sisters the power of God's children's FAITH, HOPE, and LOVE. Exciting November News Coming Soon! Dear Friends and Family of Heaven's Miraculous Angelic Giving Inspirational Child, Inc.
"What is not reflected in the report is that Oakland is experiencing a more significant drop in crime this year. As of Nov. 11, reports of serious crime were down 13 percent in 2009 compared with the same point in 2008, while homicides had dropped 17 percent." To see where your city ranks, please check out this link below. What a glorious Thanksgiving present! with people in Camden, N.J., St. Louis; Oakland; Detroit; and Flint, Mich. According to the article from the Mercury News, these are the most dangerous and violent cities in America. Peace be with Oakland, Camden, St.Louis, Detroit, and Flint. I received the following from Troop Sapce in an email... Please help in any way you can. Please pray for Daniel Thornhill. May God heal, comfort and Bless Daniel for his courage, service, sacrifice for us all. There is a wounded soldier in Fisher House at Ft. Sam Houston Texas, by the name of Daniel Thornhill. Sgt. Thornhill lost both of his legs and both arms as well as being burned over 56% of his body, while serving his country in Iraq. Daniel has been at Fisher House for two years and his parents are reaching out to people for moral support of their son. His parents are asking you to please send cards and letters to show him how much his service has meant to us and to let him know we do love him for what he has sacrificed for his country. His parents are worried about his emotional status. He hardly has any visitors. Happy New Year Friends and Family of Heaven's Miraculous Angelic Giving Inspirational Child throughout the World! Although we have struggled to raise money to create Service- Learning chapters, we are motivated by the infusion of Service-Learning activities that have been taking place throughout the world this year. Many people have begun to think of positive ways they can use service-learning to impact their communities. Our Google AdWords Grant continues to help us reach people throughout the world and inspire them to implement service-learning in their communities and create projects that can make a global impact. In many ways we have begun to see our mission and vision take flight in communities throughout the world. We hope that our organization's mission, vision, and ideals will help inspire many people throughout the world to believe in a Supreme Being and His messengers, who will guide them towards peace, prosperity and abundance in the future. We understand that these are extremely challenging times and for those of you who are unable to support us financially, all we ask is that you pray for our organization, you share our mission, vision, and research with others and that you do whatever you can to create a more heavenly world on a daily, weekly, monthly, and/or yearly basis. It could be as simple as picking up a piece of trash that didn't belong to you, or smiling and responding to the person who is checking you out at the store. Remember Mother Teresa's voice... "Do no great things, only small things with great LOVE"
Whatever it is that you do, in 2010 do it with absolute joy, because we are all part of the fabric, that once woven together creates a miraculous tapestry. Just showing up in the inner city on that weekend will create a ripple effect that will make a miraculous impact beyond measure for generations! Be the faith, hope and love that is so badly needed to heal the world! God bless you forever and may you have a blessed 2010! You always have been and always will be in our prayers. May all of His angels serve you in your time of need. Trust that God will care for you in this challenging time. Peace to you, your families, friends and country. For those of you throughout the world who would like to contribute to the Haitian relief effort, I have found Doctors without Borders to be an excellent investment in eliminating pain in Haiti and throughout the world. You can donate from here. You can even become a "Field Partner", donate monthly, and know that when disaster strikes, you are already doing your part to help those in need. I love this photo! I hope you all love it too! Tenth Anniversary Newsletter February 2010! We have officially reached a decade of sharing Service-Learning. Some of those years were spent engaging in local Service-Learning activities, some were spent on researching on Service-Learning, and more recently, in the past three years we are reaching a global audience. and those of you who have supported our organization and kept us in your prayers. When there are tragedies throughout the world, and people lose their loved ones, we are comforted with the fact that one day we will be able to build Heaven's Miraculous Angelic Giving Inspirational Service-Learning Chapters for all of your loved ones. We trust, hope and pray that you will also find comfort in creating Heaven's Miraculous Angelic Giving Inspirational Chapters for your loved ones in the future. We believe that February 14, 2000 was the perfect day to incorporate our organization! We desire to spread LOVE throughout the world through Service-Learning to those in need. We desire to honor those you LOVE by creating Service-Learning chapters in their honor, and we trust, hope, and pray that tolerance in faith will lead the people throughout the world to LOVE one another, and that peace will reign in His Kingdom in the future. We trust that He and His Angels will guide us there. "He Misses You, Come Home and Make Him a Priority"
I am doing my best to have it on our website for you in April. People of Poland, and Polish people throughout the world, you are in our thoughts and prayers. Although our organization has not done well with fund raising and building Heaven's M.A.G.I.C., Inc. chapters, we are thrilled about the fact that Service-Learning is becoming more valuable to communities throughout the world. Recently, Arizona schools have had to made more cuts to their budgets in education and many after school programs have been cut, so there is a lot of potential for our organization's mission to be accepted, appreciated and approved of by private, public and charter schools in the future. Unfortunately, while I did make an alternate list for the Doctoral of Educational Leadership program at Northern Arizona University, I was not accepted. This was most likely due to the fact that many people had more experience in leadership and within the field of education than I did. I might consider reapplying in the future, but I am also considering other opportunities. At this point there are many obstacles to overcome in order for our organization to be embraced in the public school system, but we continue to do our best to make sure people are aware of our mission and vision. Optimistically speaking, I am young and have many years to acquire the skills that are necessary to move our organization forward and once I am retired form the classroom I will be able to devote 100% of my time to accomplishing our mission and vision. They also came up with several inspirational ideas after watching the" Paper clips"movie. http://www.snagfilms.com/films/title/paper_clips/ As middle school students, they are considering creating a memorial for the 911 tragedy in the future. As much as I would have liked to accomplished many big things this year, I was only able to accomplish a few small things, but I did them, as always, with great LOVE. "Never worry about numbers. Help one person at a time, and always start with the person nearest you." We have enjoyed our monthly Sunday visits into the inner city "Capilla" and have gained a lot of joy, awareness, insight and wisdom from them. We have also imagined what it would be like if more people were willing to make the switch and descend upon those in need and those thoughts bring tears of joy to our eyes. Exciting news for the people in South America! This gift will help heal the past and create more prosperity, abundance and happiness in the future. People of Uganda, you are in our prayers. May He serve justice on those who persecute you for your faith. May He watch over you and keep you safe. May you rise above the violence and create service-learning chapters to honor those innocent people who have been murdered by evil and hate. Please pray for Uganda and peace and religious tolerance throughout the world. We were devastated to hear about the accident at the Love Festival. To leave condolences for the families and friends who have suffered great loss, please go to this site. Poetry to comfort you and others in your time of loss. Our thoughts and prayers are with the people of Pakistan and China. We pray that they will receive the aid they need form others and that they will be able to rebuild their lives after so many tragic losses. As I had promised before this newsletter will be dedicated towards listing those who may be named as the benefactor for Heaven's Miraculous Angelic Giving Inspirational Child, Inc. Chapters. 1) Innocent victims of senseless acts of youth violence. 2) Those in the armed forces who have gallantly served their country. 3) Police officers, firemen/women, and emergency rescue team members who have died in the line of duty. 5) Innocent people who are killed by terrorists. 6) People who have died as a result of accidents, natural disasters, and/or crime/violence. 7) People who have died as a result of losing a battle to a disease. 8) As a gift to show appreciation to someone you love that will benefit others. 9) Someone who made a significant difference in you life that you would like to honor. 10) As a way for an entire family to unite, honor their matriarch and/or patriarch. 11) A way to honor a special Priest, Rabbi, clergy, pastor, etc. 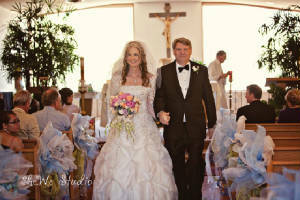 12) A way to celebrate retirement, anniversaries, baptisms, weddings, births and/or graduations. These are just a few of the ideas we have to create benefactors for Service-Learning chapters throughout our community, city, state, nation, and world. We hope that many of you will consider creating Heaven's Miraculous Angelic Giving Inspirational Child, Inc., Service-Learning Chapters in your community! An amazing story from Sherwood Elementary School in Tennessee! God bless everyone who contributed! What a Glorious Day when the miners started to emerge on the surface! 12 nations coalesced to SAVE lives! http://www.foxnews.com/world/2010/10/12/rescued-chilean-miner-returns-surface/God bless those nations! The testimony of all of the miners is a beautiful display of courage, faith, and perseverance. We and others throughout the world were absolutely heartbroken when we heard about the miners fate in Chile, we prayed and God answered our prayers! Saving the miners is a perfect example of how important it is for all of us to work together, pray together and coalesce to accomplish a goal. And as we celebrate this miraculous day, we also will never forget those miners in Heaven whose families and friends have not been as fortunate as Chile has been. WITH GOD and His Angels ALL THINGS ARE POSSIBLE!!! The unity, faith, commitment, and loyalty of Chile and the world to SAVE 33 miners is IMPRESSIVE!! At this point the optimist in us says..
"What could be more MIRACULOUS than accomplishing our vision and mission without ever receiving a single dollar?" What if you were the teacher willing to work with students after school in an organized Service-Learning environment? What if you were the community member who donated office supplies to those teachers who were volunteering their time? What if you were the professor who donated their time to make sure the teachers who were involved in the program had the best updated professional development in the field of education? What if you were the student who was willing to volunteer their time to participate in a variety of Service-Learning activities after school to improve your community, state, nation, and world? Have a blessed Holiday season and prosperous New Year! AUSTRALIA YOU are in our thoughts and prayers! We all mourn the loss of Heaven's Miraculous Angelic Giving Inspirational Child, Jordan Rice. Please see poems after "Tragedy in Tucson" article http://www.heavensmagic.org/id34.html and share them with others. We hope they heal your hearts. We trust that God will give you the strength to endure and rise as the light above the darkness. We trust that justice will be served for your families and friends. Withhttp://translate.google.com/# we can share our love with the world! May God guide you to liberty, justice, peace and abundance for ALL Egyptians in the future. وفقكم الله إلى الحرية ، السلام والعدالة وفرة لجميع المصريين في المستقبل. May God guide you to liberty, justice, peace and abundance for ALL Libyans in the future. وفقكم الله إلى الحرية ، السلام والعدالة وفرة لليبيين الجميع في المستقبل. We trust that the entire world will reach out to you to help you during this time of devestation in your country. This newsletter is an addendum to the "Fruits of the Spirit Campaign" and it can also be located under the "Fruits of the Spirit Campaign" tab on the website. The Fruits of the Spirit Campaign Continues to Flourish! The idea came to me from the Holy Spiorit, this article http://azstarnet.com/news/local/article_41bce44b-a6c8-5268-b1b1-88282d1eb99d.html and the fact that anytime I am out in the Arizona heat, and trust me there is not much hotter than that, I am just saying, well, anyway... Anytime I am out in the Arizona heat, I would rather have an umbrella to shield everypart of my body from the sun's relentless heat. We trust that you will honor those who's lives were brutally cut short with Service-Learning projects throughout your country. Those of us in Tucson, Arizona and the surrounding areas know your shock, grief, pain and numbness. We know there is nothing that we can do or say to heal the wounds that have scarred your hearts. We trust that the faith, hope and love of your fellow countrymen and those around the world will lesson that pain over time. We hope the poem below helps heal your heart and the hearts of those you love. As always, we continue to pray for peace in the world. Heaven's Miraculous Angelic Givign Inspirational Child, Inc.
du ble aldri dømt til å dø. ditt kjøtt var aldri gjennomboret av en spiker. du aldri hadde på seg en krone av torner. du var aldri hengt på et kors. du kan nå meg i min himmelske hjem. slik at jeg kunne være med deg hver dag. Husk at jeg elsker deg av hele mitt hjerte. og er nå en perfekt tid å begynne! du er tilgitt og oppfører seg som en vinner! delt glede, moro og kjærlighet vil aldri holde deg fra hverandre. De kan leve evig, som jeg gjør, i ditt hjerte. Service Learning Supervisor for K-8 after school activities! of Safford K-8 Engineering and Technology Magnet School on October 21st at 8:00.
write letters to people in the community. I also plan on delivering those letters to people in the community. students, parents and staff have for Service-Learning in the Tucson community. finally design a concrete Business Plan to meet the needs of our organization in the future. A sprout of Heaven's Miraculous Angelic Giving Inspirational Child, Inc.
in the Tucson Unified School District. faculty, students, parents and staff. and designate it for after school activies related towards Service-Learning. My dream is to be able to do this for the world on a full time basis. Take a look at Safford K-8 Engineering and Technology Magnet School here. Wow! Where did all of those months go? The students at Safford K-8 Engineering and Technology Magent School did a fabulous job with bringing in socks and clothes for the Tucson Unifed School District Clothing Bank and students in need! Unfortunately, it is with an extremely heavy heart that I inform you that a kindergarten student at our school, who had just celebrated her sixth birthday yesterday, joined all of His Saints and Angels in Heaven. Although I was not her educator and she was not in my class, she did spend the day with my class once, when a substitute failed to show up and her class was divided amonst the rest of us educators. She was the LIGHT, joy, and His LOVE made visible. She lived life with so much PASSION, it was absolutely breathtaking to watch. She would dig in the sand without any regard to getting dirty, walked with a spring in her step and would always catch my eye and smile when I ran into her in the hallway. Several weeks ago we were told that she went to the nurse with a tummy ache and the next thing we knew they were operating on her because of an aggressive form of cancer. I write to you of these events in pink because Bianca Ochoa loved pink. It absolutely breaks my heart that currently in my school we have an educator, Robin Gilbert who is willing to lead a Service-Learning chapter of Heaven's Miraculous Angelic Giving Inspirational Child and that the 1st Chapter at Safford K-8 Engineering and Technology Magnet School will be created to honor Bianca Ochoa. A vivacious, lively, adorbale child, who was filled with love, joy, and PASSION. I knew in my heart deep down that she was special. I had looked forward to possibly becoming her educator one day, but I will have to wait a lot longer until we are reunited in Heaven. I will never understand why someone like her was only given quality and not quantity of life. Right now I will look to my faith and poetry for solace especially "Remember" and "Life is a Gift Let Go, Give it Back to Him" to give me strength and I ask for your prayers for Bianca Ochoa's family, friends and the adminstration, faculty and staff of Safford K-8 Engineering and Technology Magnet School. The mission and vision of Heaven's Miraculous Angelic Giving Inspirational Child, Inc, was to always honor children like Bianca Ochoa, I just had no idea how close I would become to someone that we would create a chapter for and how much I would desire to make sure that people would never forget her. Once I have received her family's permission, I will post the only photo that I have of her wearing her hot pink shirt, making a butterfly in the sand on the sand area playground of our school. Peace be with you and thank you for all of your prayers. I have always believed that true leadership was about courage, service and sacrifice. Excellent leaders are not as concerned with bossing people around and being in charge, as they are with helping people to be able to take charge of themselves in the future. With that mindset, I decided to pass the torch of being the Safford Serves Supervisor to my colleague Robin Gilbert. Since that transition, Robin has done well with the Safford Service-Learning Club and has made us realize how our mission and vision will significantly impact surrounding communities in the future. To actually see an educator get excited and have so much enthusiasm with regards to Service-Learning is breathtaking!! Currently Robin is being supported by a grant earned from the federal government. Ideally, we would prefer that her support come from local businesses and/or people from the community, but she is enjoying her experience and I truly believe that once a business plan is created by experts in the field, we will be able to help Robin help serve her community while she is able to provide a way for her daughter to attend the University of Arizona in the years to come. Ms. Gilbert lives right in the neighborhood of Safford K-8 Engineering and Technology Magnet IB Candidate School and has always been excited about the impact Service-Learning can make in any community. Robin is the perfect person to be the first educator to embrace Service-Learning in a connection to our organization. She is a selfless giver, outgoing, hard working, and enthusiastic about making a difference in her community. 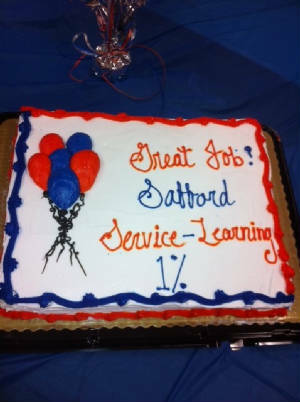 Congratulations Robin Gilbert and all of the members of Safford Service Club!! Well done! Please continue to make a difference in your community! We look forward to sharing many, many, many more amazing service learning experiences with you in the future. It is so amazing to see our motto, vision and mission come to fruition!! Heaven’s Miraculous Angelic Giving Inspirational Child, Inc. There are no words to describe the anguish I feel in my heart for the people in Newtown. As a first grade teacher, I was completely devestated by the incidents that occurred at Sandy Hook. community, in a way that will make the world a better, more peaceful and loving place. who make a significant difference in the world. to know that we all support them. Many wonderful things have also occured to me personally, but now is not the time to mention those things. Teachers of Newtown, please know that every educator in the world prays for you in these challenging times. We trust that you will continue to be His warriors, and protect His pure love and light from the evils of the world. Be the light in the darkness, no matter how dark it may get out there. Love people that seem almost unloveable, because they are the ones who need it the most. be estinguished, even in the darkest of earthly days. Both Mrs. Gilbert and I worked together with a Service-Learning activity group this past year, due to an upcoming IB certification visit, and the HUGE demands of working in a Title I school that was in its second year of correction, we had to scale back our meetings from twice to once a week, and eventually I was leading the group with the assistance of many fabulous parents. At the end of the 2012-2013 year we celebrated our accomplishments and the theme was "I am the 1%", because only 1% of the entire K-8 student body was able to participate. Many students who might have been interested in Service-Learning, had scheduling conflicts and were busy in other activities and/or being tutored. The tutoring was extremely necessary, as the school was in their second year of correction. However, recently all of their hard work has paid off and it is rumored that the school is in good standing with a C grade at this point in time. I am really looking forward to an earlier start that allows us the opportunity to go out into the community and engage in Service-Learning activities. I am also looking forward in being a part of the momentum that is already exhibited in service to the community through the Amphitheater School District and Rio Vista! In addition, to the change in my career, I also wanted to let you know that I was married on May 26, 2012:) Given all of the shootings, and the recent bombing, I found it difficult to announce such joyous news during this past year. It was a most blessed day and I am enjoying married life tremendously! Here is a picture of Matthew and I on our wedding day! As you can guess, it also took quite awhile to prepare for that joyous day. 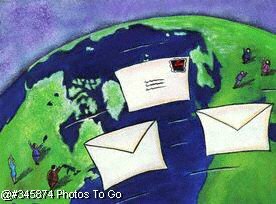 Currently, this summer I am doing my best to get our 501c3 status reinstated or consider turning Heaven's M.A.G.I.C. Inc. into a Service-Learning Foundation. Our Google Adwords Grant is up for renewal in July and without that documention we might not be eleigible for it in the future. I will continue my releationship with the people at Safford K-8 and help them with any Service-Learning needs they might have in the future, but for now I am looking forward to a new path and a new journey as I embark on once again becoming a part of Amphi! I taught 5th grade there in 2000, but was part of a Reduction in Force without any seniority. In 200 we did many exciting activies with the local hospitals and assisted liveing centers and I am looking forward to getting back to those activities in the future. Peace be with you, and remember... Every little thing you do in Service-Learning for others, is a BIG thing to them. Dear Friends and Family of Heaven's Miraculous Angelic Giving Inspirationl Child, Inc. Many exciting things have happened for Heaven's M.A.G.I.C. Inc. in the past several months. First, my personal exciting exciting news, I have transferred out of Tucson Unififed School District and I am now working for the Amphitheater School District at Rio Vista Elementary School. It is a TITLE I school that has earned an A on the state report card!!! Second, Rio Vista is very involved with the community and has a lot of support from it!! Lastly, a truly signifigant thing occured, OUR GOOGLE ADWORDS GRANT WAS RENEWED!!!! and we are so excited and greatful for that. We LOVE GOOGLE! We are really looking forward to developing a relationship with the administration, parents, students, faculty, and staff at Rio Vista Elementary School and all of those in the community who support this great school. Please see below for some of the activities occuring this month! Special thanks to Ms. Amanda Larriva, math teacher at Rio Vista Elementary School for our first donation of a variety on books on how to create books and book making supplies. Please support Heaven's Miraculous Angelic Giving Inspirational Child, Inc. by nominating Laura Ann Osterman for the Global Teach Prize. We promise that all of the $1,000,000 will go towards creating Service-Learning chapters throughout the world. Heaven's Miraculous Angelic Giving Inspirational Child, Inc. would do miraculous things with this prize. With God's blessing we can change the world! People can easily turn the 100 Day SOUPer Challenge into a Service-Learning activity by creating soups and serving them to people in need. Many schools actually have gardens where they grow their own vegetables and create soups for a fundraiser to riase money for others, or to feed people less fortunate in their community. God Bless all who support the G.I.V.E. Act!